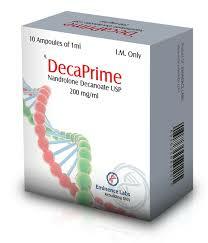 Decaprime from Eminence Labs is a steroid with high anabolic and androgenically low activity. The structure of the drug is the active ingredient Nandrolone Decanoate – a popular ether with high power and long action. The properties of the Decaprime are spoken all over the world, today it is not a problem to buy Decaprime from Eminence Labs in USA, the price for it is quite high, but the effect and a huge amount of reviews you can find on our website and on all Internet will assure you that it is worth the money. Today Decaprime is mainly used in sports practice. Bodybuilders take nandrolone in order to build muscle. Speaking of building muscles, we mean colossal volumes, because the course of Nandrolone is a reference and there is little that can be compared with it. The optimal dosage is in the range of 200-600 mg per week. Scientific experiments have shown that the best results are achieved when taking 4 mg of the drug per 1 kg of body weight per week. Those who choose a dosage of less than 200 mg per week feel only a very weak anabolic effect, which is greatly enhanced with increasing doses. In the range of 200-600 mg per week, the anabolic effect increases almost in direct proportion to dosage. Those who take more than 600 mg per week, shift the ratio of positive-negative effects towards side effects, because in this case, the anabolic effect no longer increases in proportion to the dosages, i.e. 1000 mg per week will not bring better results than 600 mg. For newcomers in steroid courses, it is better to settle for 200 mg per week. Decaprime is a good basic drug that is combined with other steroids for building muscle mass, and is best with Dianabol and Testosterone. The famous combination of Dianabol-Deca provides a rapid increase in the volume and strength of muscles. Most athletes usually take 15–40 mg Dianabol per day and 200–400 mg Decks per week.